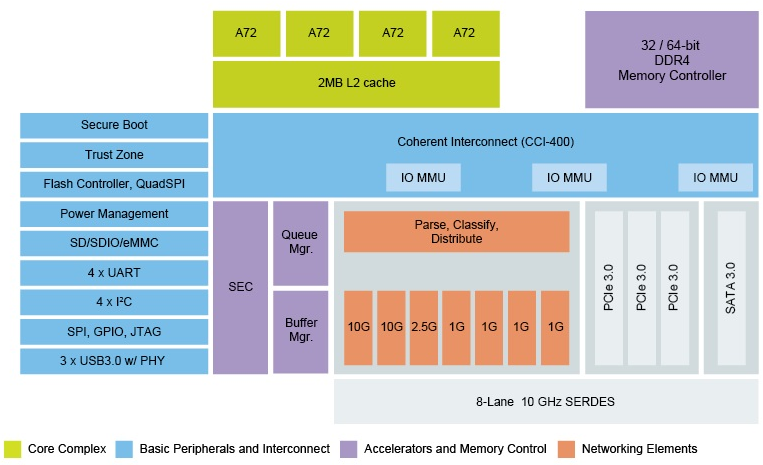 NXP has unveiled a new QorIQ communication processor with LS1046A based on quad ARM Cortex-A72 cores, and including 10GbE, PCIe Gen.3, SATA 3.0, and USB 3.0 interfaces. The processors targets CPE and vCPE (virtual Customer Premise Equipment), routers, NAS, and service provider gateways for the home and small office, as well as single board computers. CPU – Four ARM Cortex -A72 cores with 2MB L2 cache; 32,000 CoreMarks. Packet processing acceleration – Packet classification and distribution; hardware work scheduling, shaping, and buffer management. The company also mentions LS1026A processor in the product page without much details, but it’s likely the dual core version of the processor. NXP QorIQ LS1046A processor will become available in Q3 2016. What a beast with those 10Gb and Gb interfaces. Can we really expect this is in consumer CPE’s and devices in Q3 2016? Hmmm, guessing this will be at least $20-25…. Not a bad chip though, but cost wise it won’t be competitive for consumer applications. Maybe it could be used in high-end routers like Turris Omnia? Sure can you expect designs like that. Will then look as crippled as LeMaker’s Cello: using a SoC that is capable of 2 x 10GbE and 14 x SATA and exposing 1 GbE (not 10GbE!) port and 2 times SATA on the board. i would suspect that these kind of ARM SoCs are able to replace x86 designs in ‘high end’ NAS configurations and stuff like that. I was considering a Turris, but this SoC makes me wish the Turris had it. Would make for a great VM box. finally a server SoC. Hoping someone will build an affordable board. Tarantulas-Pi ??? Quite promising SoC for NAS, routers or personal clusters, sadly no one is going to make cheap dev boards with this kind of powerful SoC. @Arnab, let’s wait and see – Freescale’s parts do enjoy popularity among makers, thanks to their superb documentation. The specs mentioned 64bit DDR4 memory controller … does anyone knows how much real physical memory can it use? Many SOC seems to limit their memory to 2Gb.